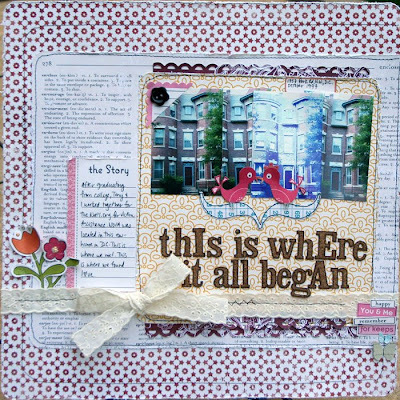 Yep, here we are again... CMK blog hop time! This July kit is seriously goooorgeous - it's packed full of yummy October Afternoon goodies, as well as some Lilly Bee papers as well. You can check the kit out in greater detail here. And don't forget to check out the layouts from the other girls on the DT (links on the left)! Hope everyone had a great weekend and is ready to face a new week! We had a great time at an engagement party for one of my good friends, and Tony and I also got to enjoy a spa day courtesy of my parents for a belated anniversary present. It was soooo nice, and my parents are the best!! Happy Monday, everyone! The title is wonderful!!! love the details of layout!! I think it's so fantastic that you went and took the photo of this place because it had such significance to you. Love the kissing birds and all the details on your page. gorgeous. Awwwww Staci, this is such a beautiful layout!!! So glad you got to have a spa day!!! Take Care! What a wonderful memory to revisit! Makes me go "Awwww!" Love all the wonderful little details in this layout! how beautiful is this.. I adore the layout Staci! GIRL!! This page is so gorgeous, and I just love the fact that you stopped by to reminisce and take this photo last week! Your kiddos will appreciate that you documented this. Love all the gorgeous embellishing. Swoon!!! I'm lovin' this gorgeous creation STaci!!! Every detail is so perfect and gosh how cool that you took a picture of your first place. how wonderful ! love all your stories ! what a fab mix of pps this kit is ! really works so well here ! This is yummy! I love your attention to details and all the stitching that you did as well. Way cool to get that story down as well, those kinds of things are so cool for others to see and read!!!! 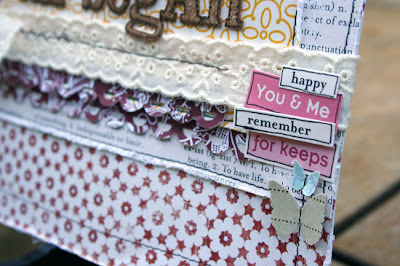 fabulous layout and such a great thing to scrap! Thanks as always for the inspiration and for all your support lately too! You are a good friend! lov those layers of pp! Gorgeous. What a fantastic page. Beautiful page! 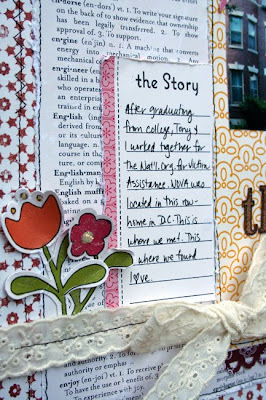 Love the hand-cut design and the strips of lace & patterned paper. Love everything!